USDA, 1997. Good. Stiff wraps. ; 73p., illus. Garden City, 1971. Good w dj. Cloth; 341p, illust. Garden City, 1971. VG w dj. Cloth; 341p, illust. Garden City, 1971. Good+ w dj. Cl, 341p, illust. Garden City, 1971. Good; no dj. Cl, 341p, illust. Lawrence, 1956. Good+. Stiff wrs. ; 76p., illus. U. of Utah, 1994. As New. Cloth; 224p., illus. NY, 1988. nFine w dj. Cloth; 255p., illus. 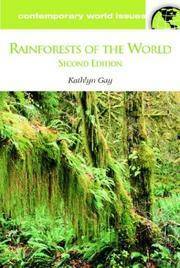 RAINFORESTS OF THE WORLD; 2nd ed. Garden Way, 1976(88). nFine. Paper; 234p., illus. Garden City, 1966. Good Ex Lib. w chipped dj. Cloth; 225p. w illus. U of Alabama Press, 1994. Fine w dj. Cloth; 273p. Deyrup, M. & R. Franz, eds.